This month, artist David Walker returns to the city where he first made his mark with a major solo show ‘A Blank Canvas is a White Flag’. Walker’s first London gallery show in three years, sees this incredibly talented urban artist presenting a fresh new take on his signature portrait style in a show named after a mantra coined by the artist himself; which refers to the creative battle an artist wages to create work in today’s climate in the face of conspiring forces both internal and external. Internationally known for his portraits consisting of explosive colour palettes and piercing realism using only the spray can and without the aid of brushes, ‘A Blank Canvas is a White Flag’ sees an evolution of his work to include a variety of processes and styles including sculpture, photography and printmaking made in collaboration with RYCA and Schoony. For fans of Walkers street work, there will be new work to track down on the streets of the capital; and not all of it on walls. The main body of new works in the show titled as ‘arrangements’ are in the tradition of Walker’s portraiture but with a physical difference. 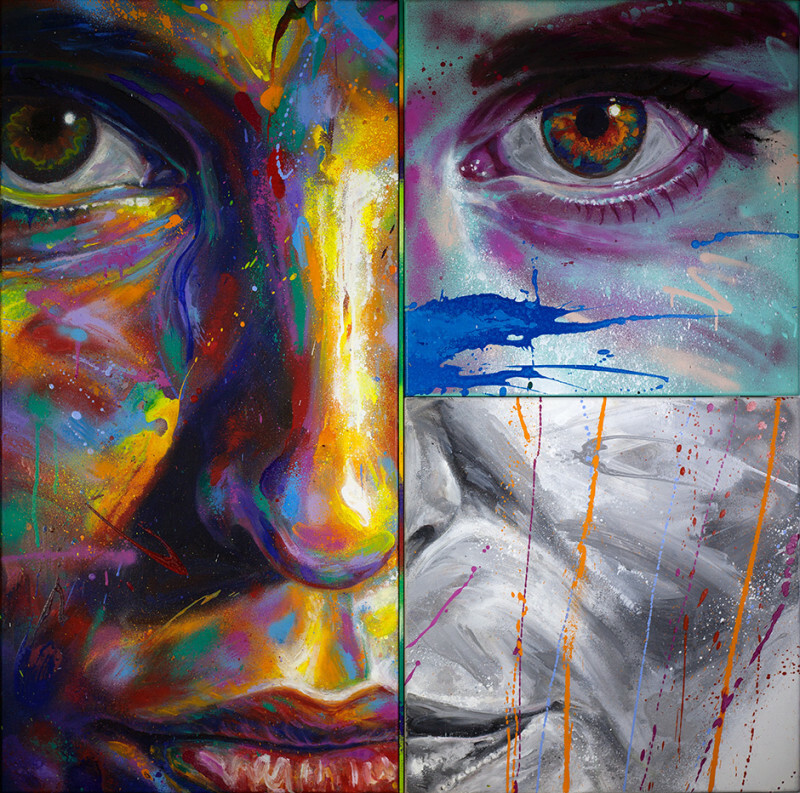 Single portraits are created across multiple canvasses each with their own self-contained colour theme and nuance. There is both stillness and energy contained in one image, where monochrome sections sit against flesh tones while photorealistic sections collide with expressionistic marks and vandal-esque colour fields. Perhaps the most arresting works on display in the Hoxton Gallery are Walker’s Pour Paintings; portraits created via a new technique that the artist has developed by literally pouring paint onto canvas. Since setting up studio in Berlin in 2012, Walker’s work has been in demand around the world at solo shows, art fairs and auction houses. As at home in the street as in the gallery, in 2014 Walker has painted murals in New York, Belgium, Paris, London, Miami, Sweden and Berlin as well as a solo show in Miami.